All great things will come to an end (but other beautiful things will take their place). If you haven’t entered for your chance to win these great prizes, you only have today to do it. Tomorrow I’ll be picking the winner! And the sale will also be over today; I can’t tell you when you will see this great sale again, so take advantage! As part of the birthday celebration, a featured designer of the day will give away two patterns. Be sure you enter for your chance to win there too! This is the last featured designer giveaway for the celebration. 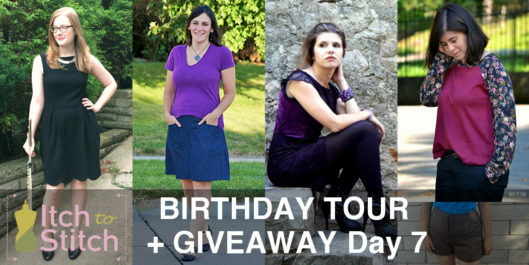 Huge line up of the birthday blog tour today. We have 5 fabulous sewists and bloggers adding their creativity to their Itch to Stitch patterns. Cheryl of Red Knits sews and knits as a welcome distraction from graduate school. She’s currently focused on building a versatile wardrobe to take her from the classroom to the dance floor. This Marbella with a scalloped hem is the perfect LBD for many occasions, but especially an upcoming wind ensemble concert. “Hi lovely Itch to Stitch readers! I am Sara and I am addicted to all things sewing. I love to sew for my three kids and for myself, and I share my makings over Made by Sara. I just don’t seem to be able to get the competition entry to work. It keeps saying unknown error! Please enter me! Fondest memory was seeing up my first dress for my daughter and it came out beautiful! That one is still my favorite creation to this day even though it had many flaws! Fondest sewing memory….hmmm…..maybe when I made my first dress in 5th grade. My fondest sewing memory was sitting with my mom, as she worked to make my wedding veil by hand, while I was hemming the dress of one of my bridesmaids. My parents came up for several months, each weekend, to help my husband and me to work in our house, perfect our garden, figure out the food, and do other numerous tasks to help organise our wedding day…..that was 29 years ago, and I’ll never forget the love and care that they showed during that time. Fondest sewing memory has to be my first sewing class, where I went from poking around on a machine to having some actual knowledge about sewing. Fortunately, I’ve continued to learn since then, too.